Morocco boasts a varied landscape: orchards of olives, almonds, and lemons; fishing boats crowding the seashore; and sheep and goats grazing on the mountainsides. Its colorful markets keep Moroccan pantries well stocked with exotic spices in every color and aroma. The intriguing cookware includes the couscoussière, a two-tiered metal pot for cooking couscous, and the tagine, a shallow earthenware pot with a tall, conical lid for cooking its famous stews. 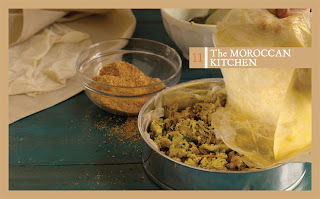 Here you will read about some of the staples of the Moroccan pantry and learn how to make bisteeya, a lavish savory pie with a buttery, paper-thin pastry, topped with a dusting of confectioners’ sugar—an appropriately sweet finish to your journey through the global kitchen. Cumin is one of the most popular spices of the Moroccan kitchen. For the best flavor, always toast the whole seeds in a small, dry skillet to release their aroma before grinding them in either a mortar or an electric spice grinder. When uncooked, couscous, small beads of rolled semolina, look like tiny pellets. When steamed, they swell and become soft and fluffy. Boxes of precooked couscous—often labeled “instant” or “quick cooking”—hold the same couscous you see sold in bulk in specialty-food shops, health-food stores, and many supermarkets. The box directions produce a satisfying but heavy starch, but when steamed in the traditional way (page 316), the results are lighter, fluffier, and more tender. Orange-flower water and rose water are used to flavor desserts, sweets, and beverages. Both waters are distilled from blossoms or buds and are sold in small bottles 312 in specialty-food shops and in some large liquor stores. home (page 328) or purchased in specialty-food shops. in a mortar or spice grinder. Look for ras el hanout in specialty-food shops. These paper-thin Greek pastry leaves are widely available frozen, typically rolled in plastic and packed into a long, narrow box. Phyllo is an excellent substitute for traditional Moroccan pastry when making bisteeya.